Ever since saccharine was accidentally discovered in 1879 by a scientist at Johns Hopkins University, the ongoing quest for the perfect artificial sweetener has continued. Many of these artificial sweeteners have benefits over sugar, such as fewer calories, but they also have distinct characteristics including taste and preparation. Read more to discover the differences between two of the most popular sugar-substitutes, Stevia and Monk Fruit. One thing that Stevia and Monk Fruit each have in common is that they’re derived from natural sources, rather than man-made. In the case of Stevia, a Stevia plant exists and natives have chewed on its leaves for centuries. Monk fruit, on the other hand, is native to China and Thailand and grows on vines. The plant-based nature of both monk fruit and Stevia makes them that much more popular with fans of organic natural foods. Slimming Down: How Many Calories are in These Sweeteners? One of the main motivations for trying sugar substitutes in the first place is that they’re lower in calories. 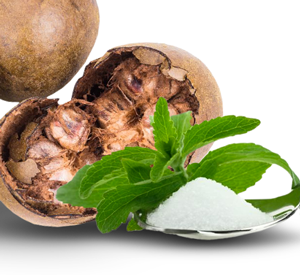 Sugar is the biggest cause of obesity in the world, so switching to either Stevia or monk fruit for your fitness needs should definitely help you shed some pounds. Both of these sweeteners are considered calorie-free, and it’s worth noting that it takes a much smaller serving size of each due to their higher levels of sweetness than sugar. Health Factor: Which Sweetener is Better for You? Both Stevia and monk fruit have benefits that make them worthy of your time. While neither will cause you to gain weight, their role in functions like disease prevention and managing vital fluid levels makes both sweeteners excellent for your health when used sparingly. Purity: How Are these Sweeteners Packaged? In the process of taking these sweeteners from the leaf or vine to the grocery store, different additives may be included. Due to taste, preparation, and preservation, Stevia and monk fruit are both packaged with other ingredients which make them more palatable. Discover how both of these popular sweeteners are typically packaged. What’s typically added to Stevia? Although very sweet, natural Stevia is known to have a bitter aftertaste. In an effort to reduce the bitterness, Stevia is often processed to attain the ideal flavor. The most common ingredient that’s paired with Stevia is erythritol, a safe and flavorful sugar-alcohol. Even when processed and combined with additives, Stevia is a much more healthy sweetener than sugar. What’s typically added to monk fruit? Monk fruit is a rare and unique melon with a strong level of sweetness and a very distinct aftertaste. This means that a lot of companies that sell monk fruit package it with certain ingredients to alter or tone down the aftertaste. Among these ingredients that are commonly combined with monk fruit are maltodextrin and dextrose, but any combination will still be healthier than sugar. Taste: What Do Monk Fruit and Stevia Taste Like? While taste isn’t a factor that you can put on a label or even compare since it’s different for different people, you can’t deny that it’s vital to like the sweetener you use. Even if a sweetener has every health benefit imaginable, if you cringe when taking a bite or sip of its flavor, it’s probably not a good match for your palette. Monk fruit and Stevia are both known to have distinct flavors that are all their own, so choosing the sweetener that’s best for you may come down to a taste test. One of the biggest mistakes people make when trying a new sweetener such as monk fruit is comparing it to the taste of sugar. We’ve been accustomed to sugar our entire lives, and so it’s natural to have that as a standard when trying a new sweetener. However, it’s important to remember that sugar has a number of unhealthy side effects that make it worth switching to a healthier alternative. Fans of Stevia love it for its ultra-sweet flavor and mildly-bitter aftertaste. However, Stevia has a lot of critics as well, such as the many who chastised Vitamin Water for using Stevia in their products. Among their harsh critiques of the sweetener were that it tasted like cough syrup and chemicals. Ultimately, the only way you’ll know if Stevia and it’s unmistakable aftertaste are right for you is to give it a try. Since as the name implies, monk fruit is a fruit, some of that fruity element comes through in its flavor. Considered 200-300 times sweeter than sugar, monk fruit extract is extremely flavorful and a little bit goes a long way. Many people who try monk fruit report an aftertaste that is indicative of many sweeteners, but it’s up to the person trying it to decide whether this is better or worse than other alternatives. With phenomenal health benefits to both Stevia and monk fruit and similarities that make both sweeteners worth a try, the difference really does come down to which one you think tastes better. Neither have calories, both are natural, and both will help various aspects of your health – but odds are pretty good that one taste will be far more appealing to you than the other. Taste the difference and see why Bhu Foods relies on monk fruit as a healthy alternative to sugar in their protein bars, cookies, granola, and other snacks. It provides a distinct sweetness without all the unnecessary calories. We wish you luck in your quest to decrease the sugar in your diet by finding the perfect alternative that works for you.